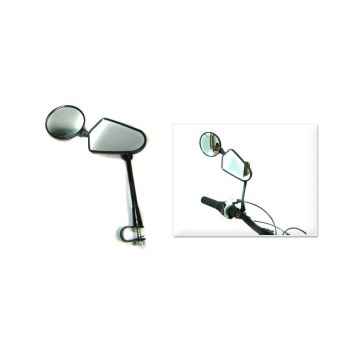 The mirror does not have enough range of adjustment when it is installed on a 1950's-style fat-tire bicycle. The angle between my handlebars (at the connection point) and the frame of the bicycle is about 80 degrees. The mirror works best when this angle is very small, as in racing bikes. I bent the rod between the mirror and the clamp to make it work. Excellent price, arrived safely (Korea to UK)!